Colorful Day out For Kids age 1 to 6! This event is curated for kids age 1 to 6. Parent enters for free. Each Child need to pay $4 inclusive of eventbrite charges. Non refundable. Baby below age 1 don’t need ticket as unable to play the games. Morning: 1030-230pm. Registration booth closes At 12pm. Afternoon: 230pm-730pm. Registration booth closes At 5pm. Once you have signed up, you would have read and agreed with all terms and conditions stated as well as understand both adult and child needs a ticket. Kids age 7 to 12 will have to pay $5 cash on day of event to play. Kindly Create eventbrite account. 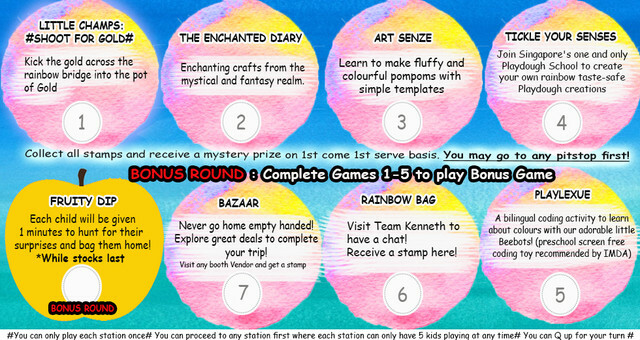 Share Colorful Day out For Kids age 1 to 6! 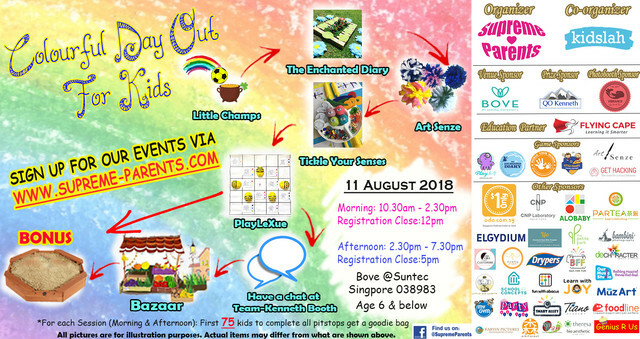 This event is curated for kids age 1 to 6. Each Child age 1 to 6, needs to pay $4 inclusive of eventbrite charges. Non refundable. Baby below age 1 don’t need ticket as unable to play the games. Registration booth closes At 12pm. Registration booth closes At 5pm. Kids age 7 to 12 will have to pay $5 cash on day of event. Some of you don’t have card or paypal. I can help to buy your child ticket but you need to give me details. N while ‘tickets’ last. Apologises if I reply slow. You may PayLah me. However I will still go through eventbrite credit card payment due to high number of check in. Thanks. So child ticket is still $4 each. You are required to create Eventbrite account to access your tickets easily. Kindly show us your ticket at registration booth. There is a unique QR code from Eventbrite to each of you to use upon CHECK IN. A photo of each child will be taken at our photo booth! We will allow 5 kids in at every interval to avoid overcrowding. No food and drinks provided. on day of event so that we can verify against your ticket details. Any updates will be updated via this portal/ email. By signing up, you agree to release your contact information and be contacted via Facebook/ meet up/ emails / mails / Sms / whatsapp/ phone calls from Flying Cape, Supreme Parents, organizer, co organizer, our authorized partners and sponsors. You are also automatically added to our mailing list where we will send our messages via contactable points provided by you such as email, mobile number and etc. You may unsubscribe at anytime by emailing us. Organizers, co Organizers, sponsors and vendors and partners, reserves the right to use any photograph/video taken, without the expressed written permission of those included within the photograph/video. Organizers, co Organizers, sponsors and vendors and partners may use the photograph/video in marketing material produced, used or contracted by Organizers. By signing up for any events organized or co organized by Supreme Parents, you will also be joining our subscriber list for Supreme Parents and may be contacted by our event partners and vendors. Ticket holder agree to release Organizers, co Organizers, sponsors and vendors and partners and all related personnel from all liabilities not restricted to loss, damage, injury or death. To ensure well-being of all children, Parent understands that Organizer/ Venue Partner will not allow entry if child has fever, and/or runs a contagious disease. Organizer will make the final decision, without dispute. It is Parent’s responsibility to supervise your own children at all times. Organizers holds the final decision for all winners. Organizers reserve the right to check identification at all times. No cancellation & no refund. Any participant found to be abusing staff, abusing other participants, disregarding staff instructions, disregarding game rules and/or are in violation of other event rules will be removed from the premises immediately and have their prizes/rewards/free gifts forfeited. Terms & conditions are subjected to changes by Organizers, co Organizers, sponsors and vendors and partners. Kids age 1 to 6 pays $4 each. We curate fun family eventS!